Alas, April is nearly over, as evidenced by the sudden briskness of the weather and the shortening of daylight. Don’t let it slow you down though, this week we’re looking at ways you can increase conversions and profit on your WordPress eCommerce website by adding a few well-chosen plugins. What do 75% of search engine users never do? See our stat of the month for the answer. Plus this month we have a super assortment of interesting tidbits. Enjoy! 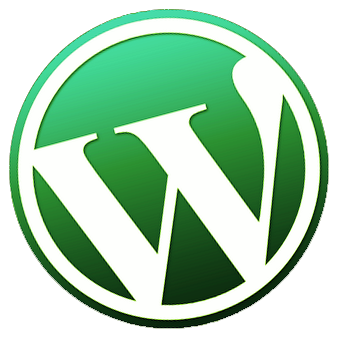 WordPress is a powerful eCommerce platform, providing a mixture of flexibility and ease of use that makes it possible for anyone to manage a complex online store. A number of free and paid templates you can be installed and set up via the user-friendly WordPress CMS, some of the most popular include WP e-commerce, WooCommerce and eShop. However, even once you’ve selected the system of your choice and got it up and running, there is still more that can be done to take your shopping website to the next level and maximise your profits. Although you shouldn’t go overboard with installing too many plugins, selectively adding a few key plugins can increase the effectiveness of your website and make it more user friendly – which will ultimately improve the rate of sales conversions. Some ecommerce / shopping plugins have these features already built-in, but if they don’t then it’s worth considering installing these additional plugins. Some of these features can also be added to non-eCommerce sites. WP Search – Users need to be able to find what they want quickly and easily or you risk losing their interest. Tags and categories are a good starting point, but particularly if you have a lot of different products a search function is essential. WP Search allows visitors to search through all posts (or products on an eCommerce website) to prevent frustration and bring them closer to their goal, and more importantly it catalogues new updates instantly to ensure new items will be searchable straight away. Quick Shop – Adding a shopping cart to the top right corner of every page allows users to see exactly what they have and what they still need. It also gives them the ability to remove items easily – this may seem counter-intuitive but it’s all part of ensuring the customer has the most hassle-free experience possible. Most importantly, by having a “proceed to checkout” button visible at all times, you make it as easy as possible for them to complete the transaction and make a sale. Simple Share – Social media sharing has significant potential for e-commerce websites, depending on your product and demographic. When it comes to shopping, the average person is very much influenced by their friends’ opinions and recommendations, so if you can encourage this through social sharing it’s a great referral medium. Providing an incentive to do this could be a good next step, such as offering a discount for sharing via Facebook or retweeting on Twitter. Simple Share does exactly that – adds simple, non-intrusive sharing buttons to posts on your website. Neat Skype Status – Neat Skype Status creates a widget that shows whether you are online, away or busy on Skype, and provides an easy link for visitors to make a call. This has two major sales benefits – first, it assures visitors that they are interacting with “real people”, not just a faceless website. Second, customers can have any enquiries, questions or worries solved instantly, making them much more likely to remain engaged with the website and complete the transaction with you. The longer it takes to respond, the more likely you are to lose them. Rich Reviews – Allowing customers to leave reviews is another great way of “humanising” online shops, making them appear active, genuine and trustworthy. Even if every single review isn’t perfect, as long as the trend is good you’ll find people more willing to digitally spend their money. Rich Reviews allows for post, category or global reviews that you can moderate to remove spam or other nasties, and will embed the results into the Google Rich Snippet of the site, making it a more attractive click in the SERPs. If you’ve got an e-commerce website that you want to give a boost, consider trying out these plugins to improve the user experience and ultimately raise your sales. 75% of users will never check beyond the first page of search results. If you’ve ever wanted proof of the importance of raw SEO, this is it. Being in the top three places is of course the best possible position for any site, however simply being within the top ten will ensure you’re in view of three quarters of search engine users. Getting your core keywords visible is of vital importance. Rich Snippets. Learn how you can make your listing stand out in the SERPs with additional information. Get Internet Famous For $68. The ultimate example of faking it ’til you make it. Civilian Journalism. The Guardian is offering assignments that anyone and everyone can be a part of. Google Business iPhone App. Manage your business listings on the go. Google Reader Replacements. As we bid farewell to the world’s most popular RSS reader, a number of challengers have emerged to fill the gap. Martian Panorama. A wide view of a surreal landscape. “Going the extra mile”. Quora is one of our favourite sites and this topic about customer service stories is well worth a read. 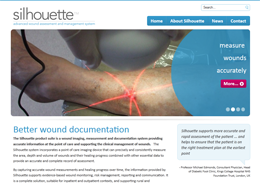 Aranz Medical offers the state of the art Silhouette wound assessment and management system. 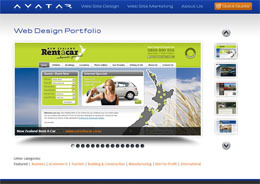 Avatar PortfolioView Avatar’s slideshow portfolio page to peruse a larger selection of websites that we have designed. Have you enjoyed this newsletter and want to send some happy vibes Avatar’s way? Why not login to your Google account then click the icon in Avatar’s homepage footer and/or rate us on Google Places. You may also want to Like us with your Facebook account. Many thanks if you do, that’s jolly nice of you!